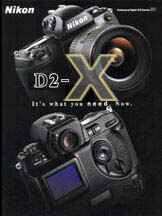 Nikon D2X --The just released camera from Nikon! The D2X captures images that are 34 to 60 megabyte files at nearly 8 frames a second-with the detail depth and color needed for all print media-even posters. From portraits to advertising or public relations photos--the camera instantly captures the photo and playback is immediate. FUJIX-Pictography 3000--This digital printer has been the standard in the industry for the last five years. The Fujix delivers rich, sharp and detailed color "C" prints and proofsheets from digital files in any size up to 9x12. MacIntosh G4 Titanium portable computer-While on location this computer allows designers to immediately select photos, create proof sheets or send an image back to the office via e-mail. QPS-Firewire DVD Writer--This tool gives us the ability to write photo-CD's quickly while on location--either for the client to take with them or for permanent storage. Quick Time-Virtual Reality Photography: a special tripod head and computer software allows 360 degree photos of any location. Site designed & maintained by Internet Chicago © 2000.